Some people love candy. I’m a sucker for Gummy Krabby Patties of all things. My hubby though, he’s not a big fan of sweets. He doesn’t crave dessert, (I know, right!?) aor delight in a slice of cheesecake the way I do. So, when I want to give him a nice treat out of the blue, or for a special occasion- I end up having to really dig for inspiration. Except, there is one thing that he LOVES. Cookie dough (not to be confused with chocolate chip cookie dough- more on that later). But, we all know that handing someone a jug of raw egg and other ingredients isn’t exactly romantic. So, I started searching for things I could make with safe cookie dough. 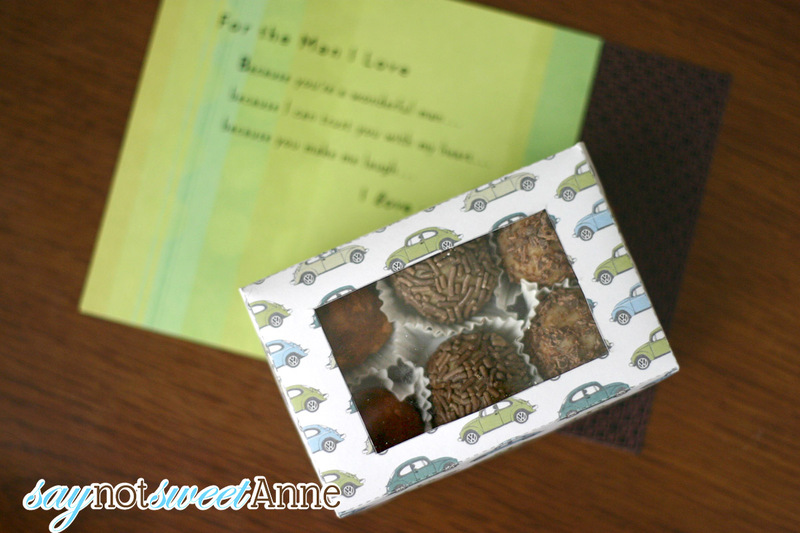 Something that could be presented in a sweet and special way, that I could leave out for him in the morning of his birthday. I wanted to give him the equivalent of a box of chocolates- but with cookie dough. 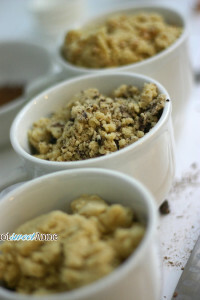 So, when I stumbled on these cookie dough bites by Cooking Classy, I got a brain storm! 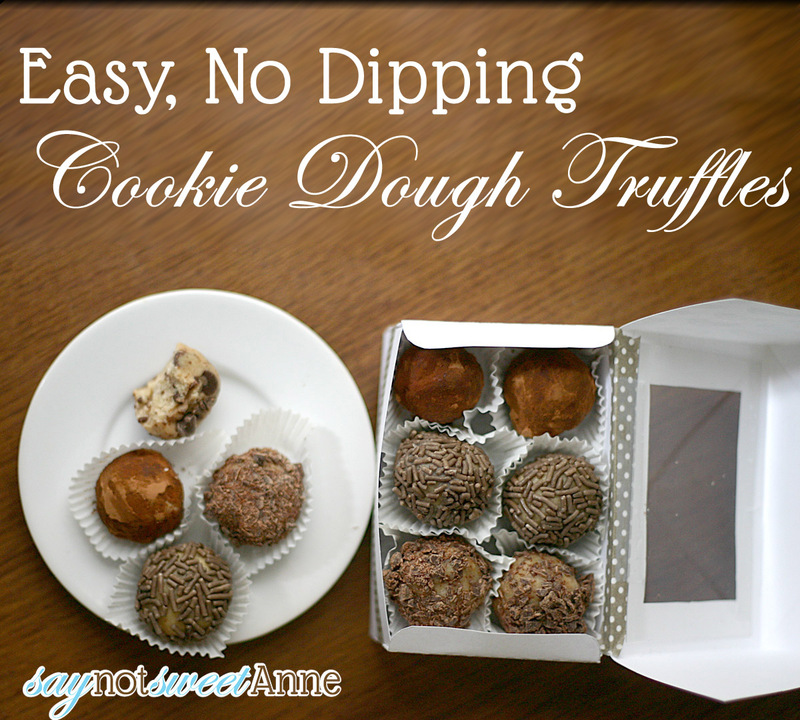 I’d make truffles out of various cookie doughs and present them like chocolates!! 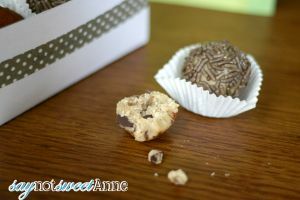 Now, I’ve seen a couple of great blog posts on cookie dough truffles, requiring the dough to be balled, chilled and dipped in chocolate. But my hubby is a purist. I know he would say it was too much chocolate and not enough cookie dough. Also, I had to whip these babies up on my 1 hour lunch period or else he would see them. So, chocolate dipping was out. 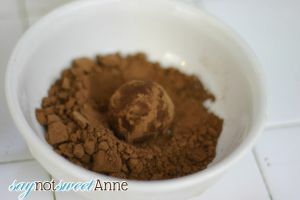 Well, I happen to know that some truffles (the french style) are ganache covered in cocoa powder instead of dipped in chocolate. That got me thinking. I decided to roll the different doughs in different coatings! That way, he’d have a visual cue that they were all different flavors. So, one lunch period I booked it to the grocery store next to work and bought my ingredients. Then, I let the mixer make the dough while I prepped my coatings. 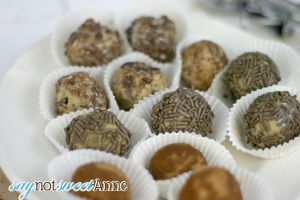 Then it was balling, rolling and boxing the truffles. Oh and did I mention I photographed it too? I might have been a little late back from lunch that day… (shhh!). Using a stand mixer beat butter, granulated sugar, brown sugar and vanilla extract until creamy and lighter in color. Mix together flour, baking soda and salt in small bowl. Add 4 tbs of cream to the wet ingredients and mix well. 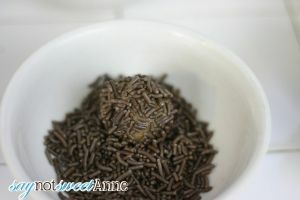 Slowly start to add the dry ingredients, mixing well. 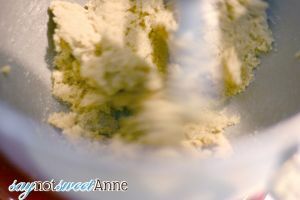 If the mixture looks too dry or gets crumbly, add in some more heavy cream. Now you’ve got a plain dough. Separate this into 3 equal parts. Leave one 3rd in the mixer. Add the Heath crunch to the 3rd left in the mixer. Mix well and then remove, set aside. Add another 3rd into the mixer. 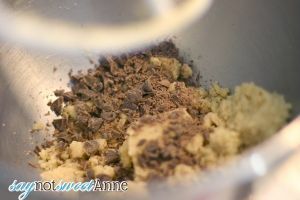 Add 1/3 cup mini chocolate chips. Mix well, remove and set aside. Now you should have 3 doughs. Plain, Heath, and Chocolate chip. 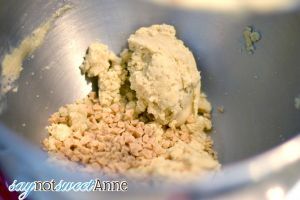 Use a spoon or (an awesome melon baller like mine) to scoop each dough into equal portions and roll into bit sized balls. Prep your coverings. 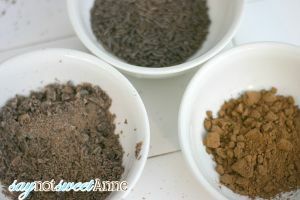 Sprinkles in one shallow bowl, cocoa powder in another, and some chopped up chocolate chips in a third. Decide which dough you want with which covering. I chose to combine the plain dough with the sprinkles, the Heath crunch with the Cocoa Powder and the chocolate chip with the chips (what else!?). Roll the balls in their respective coverings and then place them in a wrapper. You might need to moisten them slightly with a food paintbrush and some water. I hid mine in the back of the refrigerator for the rest of the day. In the 15 minutes I was home before hubby, I had just enough time to put them in their pretty box and hide them under the bed for him to find in the morning. He loved them! He ate the whole box while at work and asked if there were any extra when he came home. I think I did pretty darn good!